Arlyne, the designer of the beautiful One Life Jewelry line, describes herself as a New York City soul in sunny Florida, and you can see both places reflected in her pieces. They have the sleekness of the big city with the whimsy of the beach, and the combination is nothing short of stunning. See what I mean? 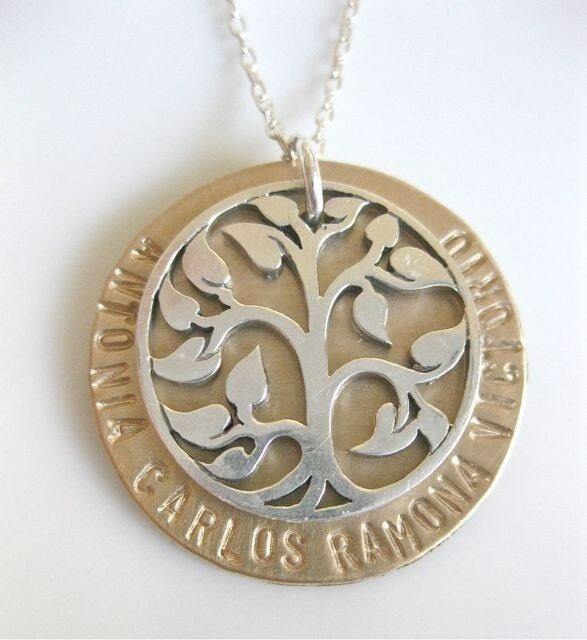 The Tree of Wonder necklace features a gold disc engraved with family names and topped with a sterling silver tree. 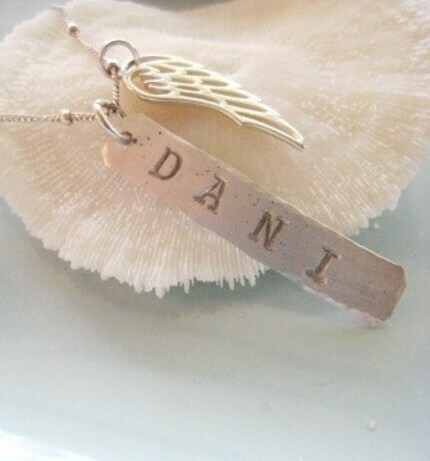 Arlyne's version of the necklace has her grandparents' names on it so she can always carry their guidance with her. Isn't that lovely? 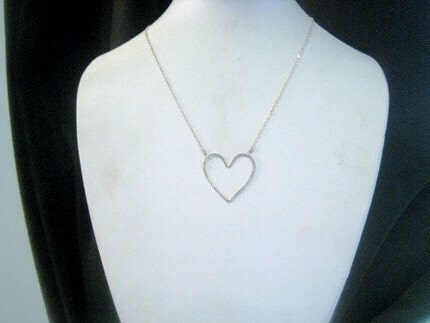 I was born on Valentine's Day so hearts always catch my eye, and the My Growing Heart necklace also caught my, well, heart. 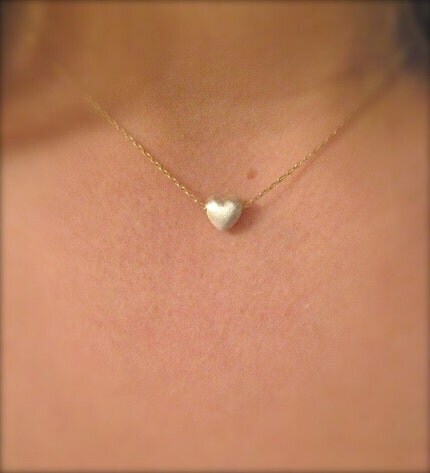 The brushed silver satin charm sits on a gold chain and I adore how delicate it is. And I love Arlyne's story about the meaning behind the name - "I just recently learned that to be happy means to GROW. And in order to grow, you have to take yourself out of your comfort zone. It is when we are faced with a big problem, or what seems to be a brick wall that we are actually being invited to step out and step up...." Words to live by. 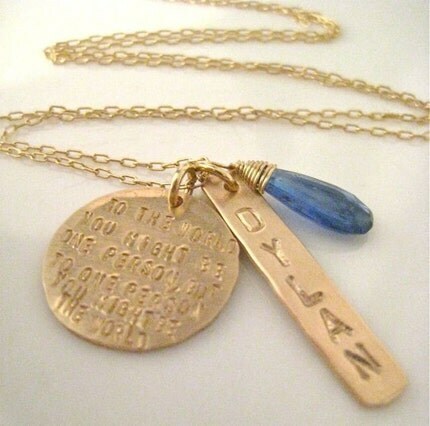 So many One Life Jewelry designs have a meaningful sentiment behind them, like the You Are the World To Me necklace. With the quote "To the world you might be one person, but to one person you might be the world," this is such a great alternative to more traditional mother or grandmother necklaces. 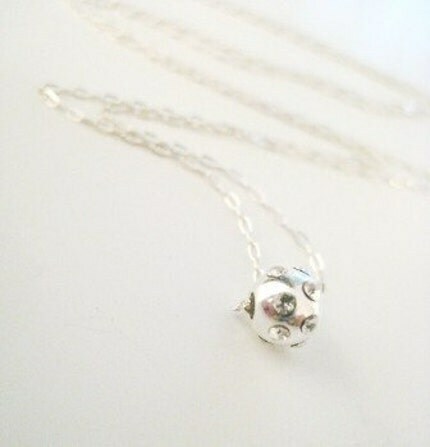 This Open Heart design was inspired by this saying "The dance of the flower in the wind, in the sun, in the rain, cannot be understood by the head; the heart has to be open for it." And the One Thousand Kisses piece is decorated with crystals like teeny tiny kisses, inspired by one of my favorite lyrics from the musical RENT, "Live in my house, I'll be your shelter, Just pay me back with one thousand kisses." 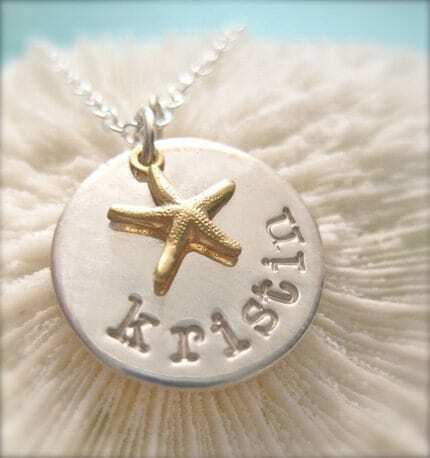 One Life Jewelry also has hand-stamped initial and name necklaces but with a fun twist. The Modern Angel has a little but of a punk edge. 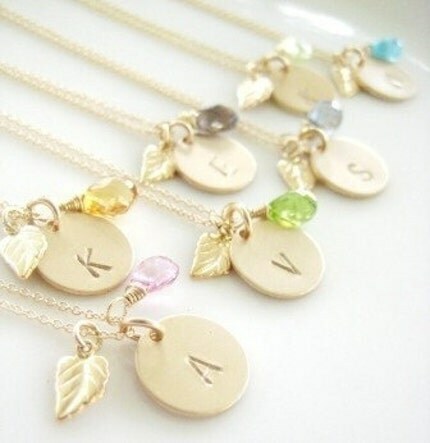 And the Sweet Leaf birthstone initial necklaces have a little bit of sass. There are so many more gorgeous necklaces and earrings in the One Life Jewelry shop. Arlyne's tagline for the store is "Inspiring and personalized, infused with joy." Couldn't have said it better myself! And one lucky AFOMFT reader is going to score a piece of One Life Jewelry for her very own! 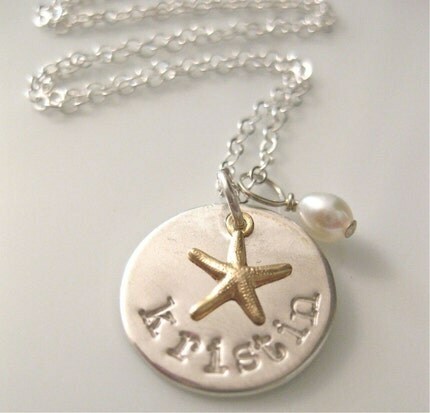 Arlyne has graciously offered to give away this beautiful Sea Star necklace engraved with the name or initials of the winner's choice. It's the perfect piece for summertime! Please leave a separate comment for each entry (two if you've blogged about the giveaway) and make sure to include a link to your tweet, blog post, etc. All entries must be posted on AFOMFT as a direct comment to this post. Comments on Facebook will not count as entries. This giveaway is open to residents of the U.S. and Canada and ends June 4th at 11:59 pm EST. The winner will be selected by random.org and announced on AFOMFT on June 7th. If the winner doesn't contact AFOMFT within 48 hours, a new drawing will be held so be sure to check back to see if you've won! Dresses to dance in, and flirt in, and talk in. 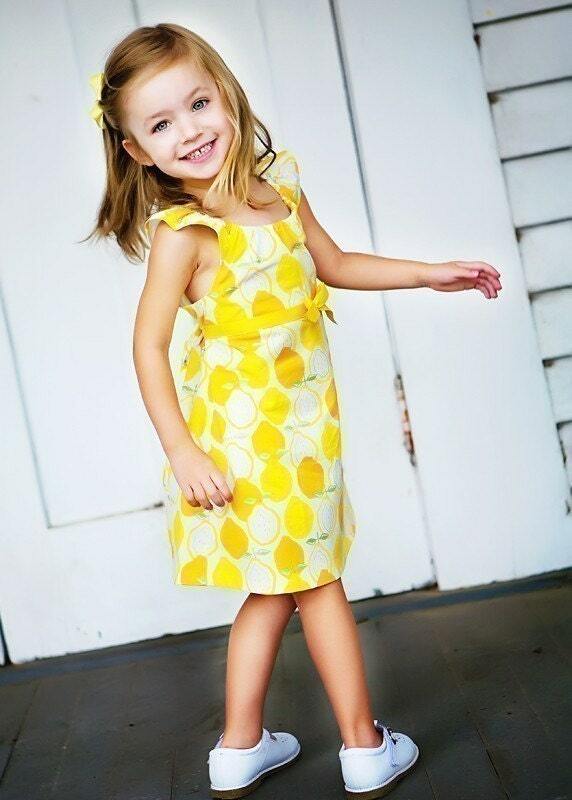 Is that not the cutest thing you've ever seen? I die. Just die! And there are lots more great get ups where that came from. 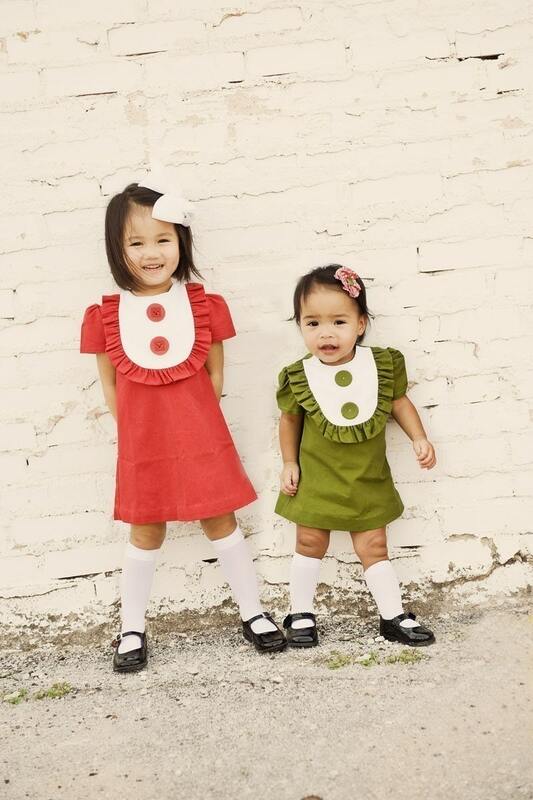 Gabrielle and Alaina would look so sweet in these coordinating bib dresses. 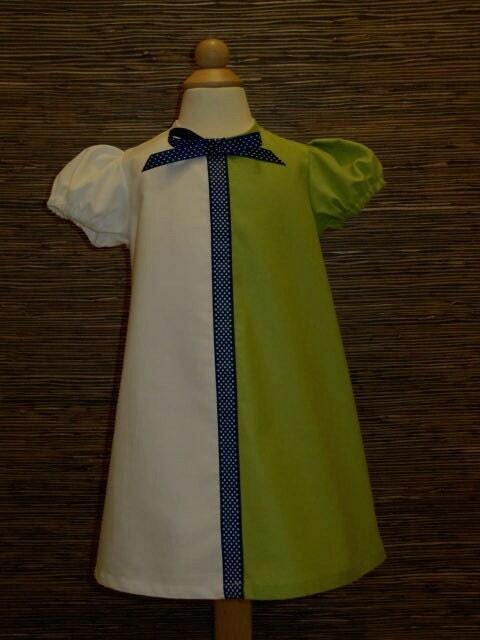 I love the little bow and the funky neckline on this A-line design. And talk about turning lemons into lemonade! This is the perfect ensemble for any summer picnic. 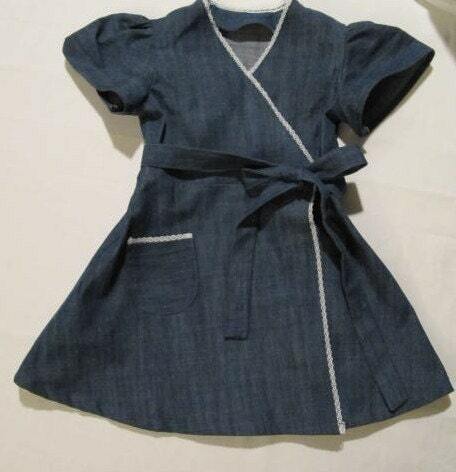 I'm a sucker for wrap dresses for me so of course I feel for this lightweight denim miniature version. 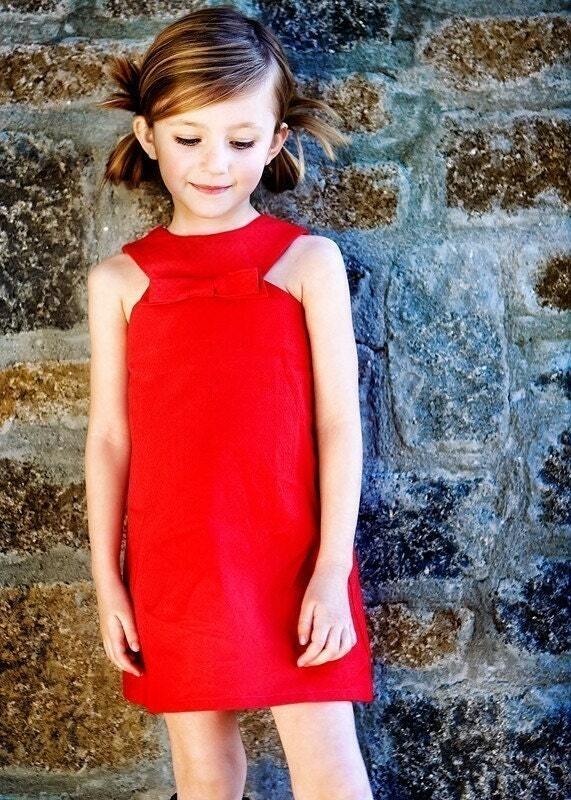 And I think the grosgrain trim on this little shift is sheer perfection. All of the designs from Faith Works 4 U are handmade, come in sizes from 6 months up to 8 and most can be customized or ordered in a variety of fabrics which is very dangerous for a dress-obsessive like me. I've already got four in my cart and I'm debating two more. Paging Dr. Drew! I think it's time for a shopping intervention! Visit Faith Works 4 U and make the store a favorite. Please leave a separate comment for each entry (two if you've blogged about the giveaway) and make sure to include a link to your tweet, blog post, etc. All entries must be posted on AFOMFT as a direct comment to this post. Comments on Facebook will not count as entries. This giveaway is open to residents of the U.S. and Canada and ends June 3rd at 11:59 pm EST. The winner will be selected by random.org and announced on AFOMFT on June 4th. If the winner doesn't contact AFOMFT within 48 hours, a new drawing will be held so be sure to check back to see if you've won! Congratulations MELISSA & NICK! 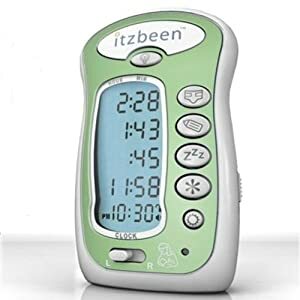 You've won the ITZBEEN Baby Care Timer! Please e-mail me at afomft@gmail.com by end of day Monday, May 31st to claim your prize. If I do not hear from you by then, a new winner will be chosen. And a huge thank you to ITZBEEN for this great giveaway! Congratulations JEN & JEFF! You've won the twin set of your choice from klzart! There are so many cute choices - I can't wait to see which one you'll pick. Please e-mail me at afomft@gmail.com by end of day Monday, May 31st to claim your prize. If I do not hear from you by then, a new winner will be chosen. And a huge thank you to klzart for this terrific giveaway! I don't know which is my favorite. Maybe the giraffe growth chart? No, the giant felt balls that can be used as toys or pillows. But wait! There's also the felt library playhouse that you make with a card table. You know what? It's too hard to choose. You can visit the treasury HERE to get more details on all of the items and decide for yourself. 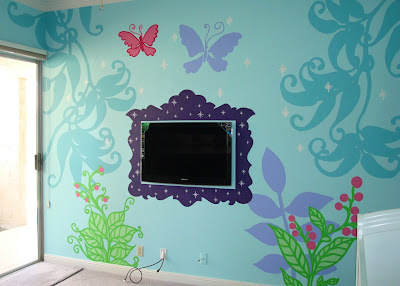 So that's what I have planned for Gabrielle and Alaina's imaginary playroom. There's nothing wrong with dreaming, right? Did you find a favorite thing in my Etsy Perfect Playroom Treasury? Or is there another fabulous find that's a must have for your little one's play space? Post a comment and tell me all about it. I'm a glutton for punishment! I had a giveaway scheduled for today but I've decided to put that post on hold and share something more personal instead. Last week, one of the wonderful members of the MoM (Mothers of Multiples) community I'm a part of lost her sweet little boy, JW. He was born at 27 weeks, the same gestational age my girls were when they were born, and he was 20 months old when he passed, the same age my girls are now. He spent those 20 months bringing joy to everyone who knew him, even those of us who never got to meet him face-to-face. I'll never forget JW's big blue eyes or his beautiful smile or the fact that the little fighter managed to touch so many people in his short life. Today, JW was laid to rest. In his honor, all of my MoM friends dressed our families in blue and blew bubbles to let JW know we love him. Here are Gabrielle and Alaina waving bubbles up to heaven's newest angel. If you're the praying type, please say a prayer for JW and for the family he left behind. If you're not, hug your loved ones a little closer tonight and be thankful for all of the beauty and joy in your life. And if you happen to have some bubbles handy, blow a few for JW. I got a lot of e-mails after posting the Silhouette Art Tutorial last week so I decided to do a few more posts featuring great gifts for Father's Day. Since this is MULTIPLES MONDAY, today's round up focuses on presents for dads - or granddads - of twins, triplets or more. I love these blocks. They're perfect for displaying in an office and can be customized to say whatever you want. Such a lovely saying for a father of boy/girl twins or triplets. Attach a picture of the kids holding a sign that reads "We love you daddy!" and you're good to go. This Cafe Press store is filled with fun t-shirts for parents of multiples like this "Twins are for Amateurs" design, which is perfect for dads of triplets (or more! ), or the "To answer your questions" tee that features the responses to all of the annoying questions we get, including "Yes, twins do run in my family. They run all over the place!" There are also options for grandfathers too. Having multiples isn't easy on the wallet so why not get dad a money clip instead? With this stylish key chain, fathers can always have pictures of their kids handy. As you may have seen HERE last week, I'm all about silhouettes lately. If you don't feel like attempting your own, here's an adorable - and reasonably priced - alternative. A simple and modern way for dads to keep their kids close to their hearts. This key chain is so sweet and ideal for any pop celebrating his first Father's Day. With all of these fun Father's Day options to choose from, you should be able to find something for even the pickiest father of multiples. And almost all of these ideas will work for those of you who with singletons too. Well, except for the triplet dad shirt. That one's really for an exclusive club! Please leave a separate comment for each entry (two if you've blogged about the giveaway) and make sure to include a link to your tweet, blog post, etc. All entries must be posted on AFOMFT as a direct comment to this post. Comments on Facebook will not count as entries. This giveaway is open to residents of the U.S. and Canada and ends May 31st at 11:59 pm EST. The winner will be selected by random.org and announced on AFOMFT on June 1st. If the winner doesn't contact AFOMFT within 48 hours, a new drawing will be held so be sure to check back to see if you've won! I have a thing for bags. You could call it an obsession but that sounds so.... I don't know, sinister. It's more like a love affair, and I have to admit, I have a new crush on Tamara Handbags. Tamara, the lovely lady behind the designs, and I went to college together and in 2003, she started her own line of handbags and accessories. Since then, her bags have been seen on celebrities including Britney Spears and featured in magazines like Lucky and Us. All of her pieces are named after her friends so I get excited when there's one titled for someone I know, like the Aria (who was my roommate junior year). There's even a Danielle laptop bag. I don't think it was technically named after me, but I love it anyway! You can shop Tamara Handbags by style or fabric. My personal favorite? The Luisa clutch in brown multi-color. It's perfect for summer. I also love the leather trim on the Carly style. If you want a small bag but can't live without a strap, check out the adorable Mandy wristlet. Or put clip the straps on opposite sides of the bag so you can wear it over your shoulder. It's like having two bags in one! Another style I have my eye on is the Amy Triple Zip Satchel in brown paisley. This design has three different compartments for so you can tote everything you need and keep it organized. I can totally see this becoming my go-to bag! And if you're looking for something more classic, the Andrea Satchel in batik paisley will get you through all four seasons in style. Before I had Gabrielle and Alaina, I never carried big bags, but now that I'm dragging blankets and sippy cups wherever we go, small ones don't make the cut anymore. The Anya tote is just the right size for all the girls' stuff and the pink paisley fabric keeps it from being boring. Tamara is the mom of an 18 month old so she knows very well what makes a great baby bag. Her diaper bag designs, like the rest of her line, are functional but stylish at the same time. I love that the Leila comes in a subtle polka dot pattern so dads can't object to carrying it, but the changing pad is a fun red paisley that gives the bag a little sass. And the Leah baby messenger is great because it can be carried three ways - over the shoulder, across your chest or hung off your stroller. It comes in two patterns and has a coordinating changing pad, hot pink lining and more pockets than you'll know what to do with! I can personally vouch for the quality and timelessness of Tamara's line. I bought one of her satchels and a matching cosmetic bag five years ago and I still carry them to this day. That's more than I can say for a lot of the bags I've bought! Tamara Handbags are sold in stores throughout the country and you can also order them online. If you live in the Boston area, be sure to check out the events section of her website to find shows and shopping events featuring Tamara's line. You can also get information on how to throw your own Tamara Handbag party and get a complimentary bag for hosting! But choosing just one may be impossible. Trust me. My cart currently holds five of them. Please leave a separate comment for each entry (two if you've blogged about the giveaway) and make sure to include a link to your tweet, blog post, etc. All entries must be posted on AFOMFT as a direct comment to this post. Comments on Facebook will not count as entries. This giveaway is open to residents of the U.S. and Canada and ends May 28th at 11:59 pm EST. The winner will be selected by random.org and announced on AFOMFT on May 31st. If the winner doesn't contact AFOMFT within 48 hours, a new drawing will be held so be sure to check back to see if you've won!